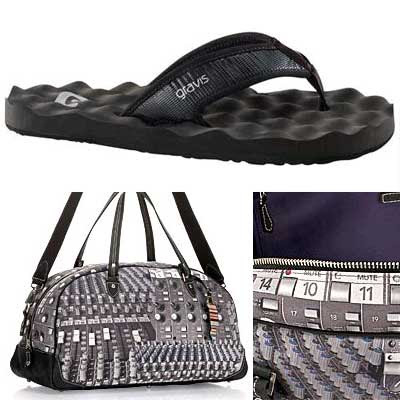 Music Thing: Gravis Soundcheck flip-flops "inspired by recording studios"
Gravis Soundcheck flip-flops "inspired by recording studios"
i think the "studio inspired" bit is marketing copy. there's quite a few egg shell style flip flops and sandals in all the shops right now. i think it's just "next big thing" hype for the summer season. The funniest part is, the bag costs almost as much as the mixer on it (it's a Mackie VLZ). You'd think they could have at the very least used an Allen & Heath, if not some sort of Soundcraft or Neve. I'm kind of confused, though - did anyone else notice the channels in the right picture are numbered 14-10-11? makers of the "T-Qualizer" which is a t-shirt with a built in electro-luminescent graphical eq display. i agree w/everyone else here.. they go through all the trouble of printing a mixer on a bag and they use a f-ing mackie??? how about a neve or something vintage and cool looking instead of that grey box of knobs.